Now, if you’re reading this and wondering if we’re on drugs as you’ve never heard anything like this before, it’s because it’s an 80 year old example of #fakenews. 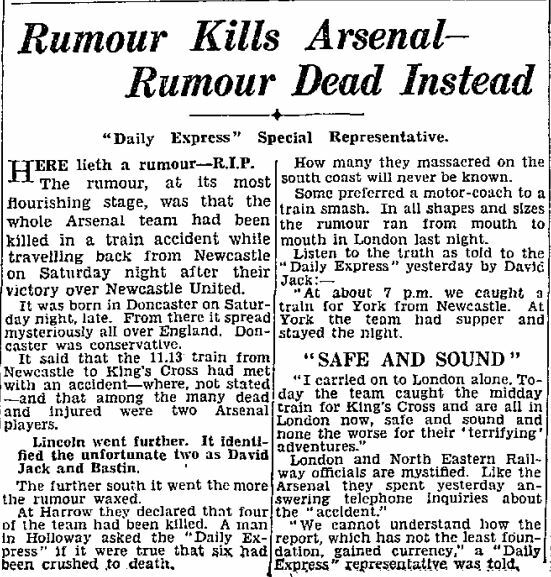 Throughout the days following the game against Newcastle, the press was full of stories that it had been rumoured that the Arsenal team had been involved in a train crash, and also that, thankfully, these rumours were completely false. 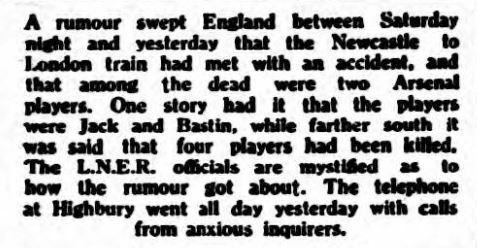 Although by the time the truth emerged, the rumours had snowballed to such an extent that at one point it was reported that the whole team had been killed. The truth of the matter was that the only player on a train that night was David Jack. He had continued his journey home whilst his team mates had stopped off at York where they stayed overnight. 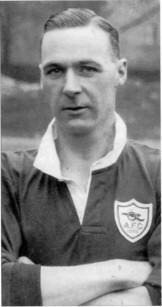 The Arsenal management, players and their families spent most of Sunday fielding telephone calls from all over the country denying the rumours and reassuring people that all of the players were very much alive. It wasn’t until Tuesday that someone offered a possible explanation. 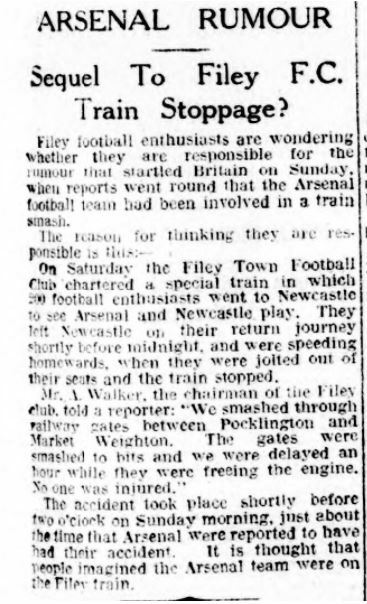 The Sheffield Independent ran a story that a group of 200 fans from Filey had chartered their own train to the game. On the way home their train had been involved in an incident south east of York, and rumours started to spread that the Arsenal team had been on this train. You may want to follow @DBNJack @WeeAlexJames @ChapmansArsenal and @CliffBastin11 on twitter as they will, no doubt, provide more information throughout the day. Arsenal lost their next two games which resulted in them being knocked out of the FA Cup and off the top of the table, but a strong run-in saw the Gunners win the League title at Stamford Bridge in their penultimate game of the season. Thirteen years later, David Jack was incredibly fortunate not to lose his life in a real train accident. On 26 October 1947 he was sat in the dining coach of the Scottish Express travelling to Kings Cross when it became uncoupled from the locomotive near Goswick. As the dining car trundled to a halt, the rest of the train plunged over an embankment, killing 28 people and injuring another 60. We have a new book due out in May that tells the story of Royal Arsenal – Champions of the South. Pre-order to have your name included in the book and also receive a limited edition print. 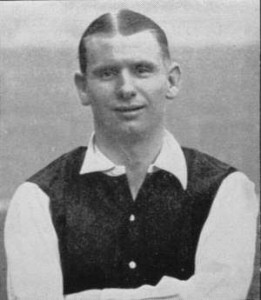 We have another website – The Arsenal Collection – that includes hundreds of items of Arsenal related memorabilia, including fully digitised programmes. Well worth a look.